Ok – I know I said I have a lot of news, and as it turns out I’ve actually got way TOO much to tell in one post. So this is merely part one of the super-large update which I’ve been planning since… well, a long time. You’re… erm… still here… right? Right, down to biz. First bit of good news. Numerous projects of mine have come to light, which, during a particularly difficult time right now, has managed to keep me optimistic enough to stop pushing pencils into my ears and eyes. Last year I wrote a single page story called A Twilight’s Promise. The plan was sketchy, but it was accepted by a small indie publisher who originally intended to collect a massive group of one page stories by various writers and have them drawn by one artist. And then that whole project fell through. So, I was left with this one page script which I knocked up in a day or so, easily the most depressing tale I’ve ever written, sitting in the drawer until I could find an artist and home for it. I found both a couple months ago. And it’s nearly finished. Good news number two. I don’t usually do this, as it slightly breaks etiquette, but just this once I’m going to. As some of you may know, I write for Sony Computer Entertainment Europe on the official PlayStation site. And while none of the great team that works here have bylines to tell you who has written what, I’m happy to say the site became home to what is, in a strange and slightly ironic way, my first piece of published (in the public domain) prose. 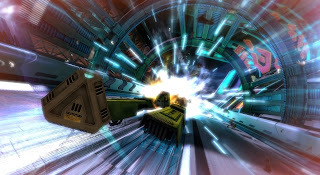 It’s a short two part story based on the Sony PlayStation 3 futuristic racing game, WipEout HD. Click on the text links below the images to read them. 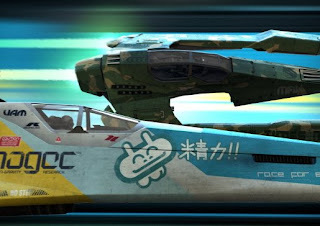 It may not mean much to you if you’re not familiar with the WipEout games, but hopefully it still makes some sort of sense if you’re not. While I haven’t fulfilled my aim of being a novel author before I turn 30 (short of me actually finishing one of my novels, it getting picked up and then put on the shelf in the next 4 months), it’s nice to think I managed to get something like this and two comic stories (yes, two – more on that next update *cackles*) out the door and publically/officially published all the same, with more to come. I have no valid comment to add beyond that. Dear Corey. I liked your story. Lots of love, Steve. p.s. could have done with more vampires. Excellent news all round :-) :-) Looking forward to you being famous..just so I can say I know you haha! Steve – My original draft of both stories had vampires, but I kept getting shouted down. Pft. Nobody knows nuthin. Never fear, the vampires are coming. Oh yes. Don’t forget to check under the bed every night as well. Not for vamps. Just me. Sweeeet. hey my lecturer saw me do a concept for my project today and asked me to be a guest lecture at one of his classes :D I think he was just a bit shocked but if it's for real then that would be pretty nerve-racking! Congrats! When will you have to do it? Lol, is L'espirit causing that many problems? Ack, sorry man - how far along are you with it? We can go back to Primes if you want instead and do some concept stuff while I finish the script? Since one of our teachers was absent today, our main tutor had to look after us as well as his actual scheduled class, so he asked me to give the class a practical lecture of Digital Concept Art which went fairly well. I told the class that they can relax and talk amongst themselves but they really went for it and started chatting away for the whole session lol! It's good though because I apparently helped this one guy a lot so it was definitely worth it :) I hope I'll get a chance to do a proper lecture some time, it was a great experience. Anyway, on to L'esprit! I'll certainly be in touch with you very soon Corey, hope you are well!! !